What's your least favorite task to do around your home? If you chose option 4, laundry, you're in the right place today, because I'm going to try and help you change that! Read on, my friend! "I have a random idea for you - you should write about ways to make your laundry room your happy place. There was a house we looked at with the happiest laundry room and it's totally inspired me to make my laundry into a place that speaks to me, because let's face it, I'm the one spending so much time in there! A laundry room is always overlooked, but why can't it be special, ya know?!" I got to thinking - she's so right! Laundry rooms are places we spend a good chunk of time in during our weeks, but all too often, they're sad, dark, and uninspiring. Like my friend said, why shouldn't we give them some love, jazz them up, and make them into places we want to spend time in? Wouldn't that make the arduous task that is washing and folding clothes a little less painful? 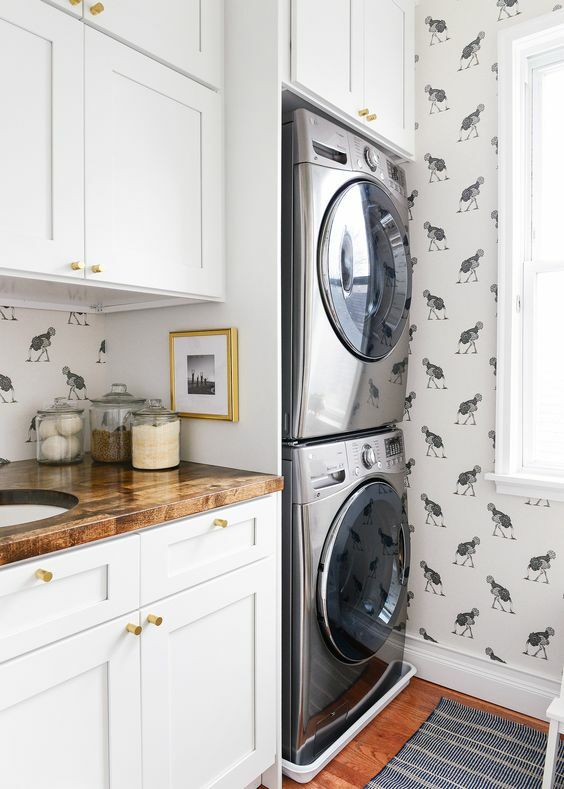 After all, our environments have a huge impact on our attitudes, so a happy laundry room might be just the ticket to making an everyday task a little more pleasant. In my own house, our washer and dryer is located in our unfinished basement. (Raise your hand if this is how it is in your house too!) We have plans to do a little freshening up down there, and I can't wait to have a functional and clean space to work in during laundry days. The purpose of doing laundry is make things clean - pretty obvious, right? So if you currently have a dingy, dirty, or cluttered space that houses your washer and dryer, begin by giving it a fresh start. This can mean anything from deep cleaning the area all the way to giving the walls and ceiling a new coat of paint. Also, here's a hint to help it stay clean: stop using your laundry room as a dumping ground for everything that doesn't have a permanent home (I'm totally preaching to the choir here - guilty!). Even if your washer and dryer live in a storage area, like your basement, make sure you don't let what you're storing take over the space you need to get the task done. I know how tempting it is to use your folding space as a drop zone! Next, add storage and organization. No matter if you have a whole room dedicated to the task or if your washer and dryer live in a small closet, I'll bet you probably have some space surrounding it to organize. Think about what storage systems will help make the task easier, less dreaded, and even pretty to look at! Ideally, you'd have a spot for functional supplies like detergent, a flat surface for folding, and a place to air dry delicate garments. If you live in a small home like I do, you'll probably have to get a little bit creative with those things, but if you do have a little elbow room, take advantage of it and think about ways you can add helpful organizational tools to the space. Now for the fun part - make it pretty! Laundry rooms are one spot in our homes that I think we should take chances with design-wise. Don't be afraid to try that playful wallpaper, use bright colors, or install some funky tile (floor, wall, or both) with an in-your-face pattern. The laundry room below is a great example of trying some of those things out - hello mint cabinets and starry floor tile! You can also go a completely different direction and create a crisp, clean, and monochromatic space. Think about how you want that space to feel when you're in it, and go with your gut on the design part (P.S. I can help with that if you need it!). Finally, don't forget to accessorize! Cozy up those floors with a pretty runner rug, add texture with baskets on shelves, grab some pretty containers to hold detergent and other cleaning supplies, hang art on the walls, and oh! don't forget about lighting. A fun fixture or sconces can do wonders for a laundry room! A final word...treat your laundry area just as you would any other space in your home. Though it's probably not a space you entertain or sleep in, you do spend lots of time in there, so give it the attention it deserves. Make that laundry room a place that puts a smile on your face every time you walk in there! P.S. 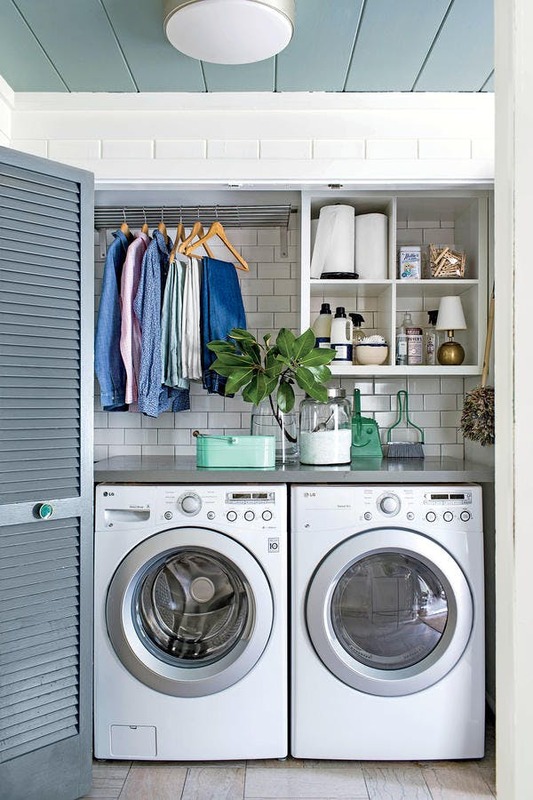 Want more laundry room inspiration? 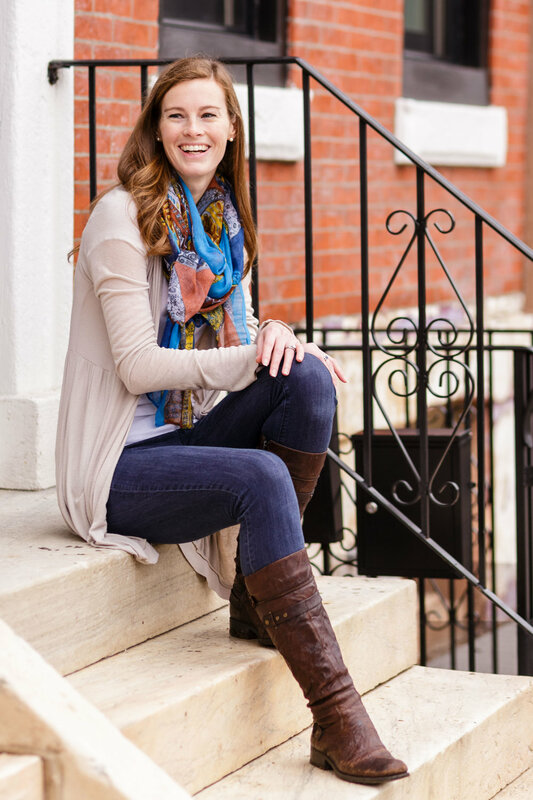 I've got a whole Pinterest board dedicated to my favorites from around the web!